New Aerial Silks Sereis Classes for Kids & Teens! We are SO excited that we are now offering Kids and Teen Aerial Silks Series classes!! We kicked off the start of the series on Valentine's Day 2018- what better day to fill our hearts with love for … [Read more...] about New Aerial Silks Sereis Classes for Kids & Teens! Hawaii residents only-w/ID; only available on your first visit; 1 per person; valid on aerial yoga classes only; good for 30 days from purchase. Private and semi-private lessons available in aerial yoga, aerial silks, dance trapeze, lyra/aerial hoop, and mat yoga. Looking for something different for your event, party, or getaway? We can customize a group session, team building workshop, bachelorette party, etc. 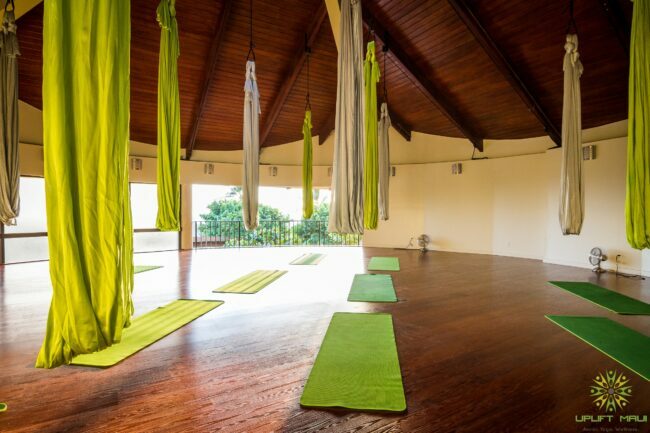 Aerial Yoga combines traditional mat yoga with postures that are partially or fully suspended in a soft silk hammock. The use of gravity allows the body to find correct postural alignment, to release, realign, and lengthen more efficiently, and invites in a sense of playfulness. Great for any ability! Looking for a unique gift for the holidays or special occasion? Gift Certificates available for purchase here!! Use for credit for classes, passes, series, private lessons, or health coaching! SUPPORT SMALL BUSINESS FRIDAY/SATURDAY SALE! 20% OFF ALL 3, 5, and 10 Class Passes!! Buy for yourself or buy as a gift for someone else!